The biggest party of the year is always the Super Bowl party. Who doesn’t love football, good beer and good friends? This borderline national holiday brings friends and fans together to watch their favorite teams in the pursuit of glory. To throw an awesome party, you have to be prepared. 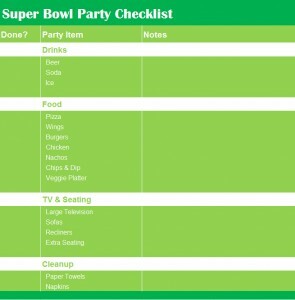 Checklist Template will help you to throw an epic Super Bowl bash! To make things easier for you, we provided a must-have list of Super Bowl party items. When you’ve completed each task, make a check in the column marked “done.” First, you have to start out with drinks and ice. Beer and soda are a necessary at every Super Bowl party. What brands to buy are up to you, but make sure to have an assortment. A smart thing would to be to have a cooler near the TV so that people won’t be running to the fridge and back during the game. In this situation, deciding on what food to get is very easy. Everyone will be in “couch potato” mode, so almost any sort of food will be fine. Pizza, wings, burgers, chicken, sub sandwiches, nachos, chips and dips are all great starting places for a great selection of food. Also have healthy food options on hand, like a veggie platter with carrots, broccoli, and other healthy snacks. When you decide to throw a Super Bowl party, you’ll be expected to have a huge television. In this case, the bigger the TV, the better. If there’s a lot of people at your party, they will be spread out more and this brings up seating arrangements. You’ll need comfortable sofas. Recliners are great for watching the game as well. If you need more seats, simply move furniture from other rooms to make sure everyone has a comfortable seat for the big game. With these tips, things should be a lot easier during the planning of your party. Print out our Super Bowl party checklist and you’re sure to throw one of the greatest parties of the year.